As you can see, in all cases there is a huge jump in number of homes sold that quickly in 2012 versus previous years. Why is this? The total volume of sales has increased somewhat, but nowhere near as much as the increase in quickly selling homes. So what's causing homes to fly off of the shelves? 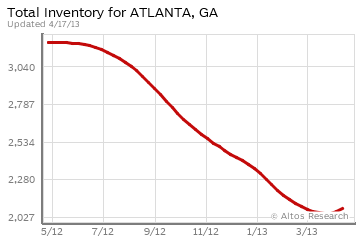 The primary driver is that fact that inventory is down. Way down. In other words, there are fewer homes available for sale than there has been in the past. The foreclosures that were flooding the market in the past are drying up. Over the last few years there have been far fewer new-construction developments being built. Fewer new single-family subdivisions. Fewer new condo and town home complexes. Fewer on-off spec homes. Many homeowners have been upside-down on their values, so they can't afford to sell, bringing those would-be sellers off of the market. Many sellers who "want" to sell, but don't really "need" to sell have given up. So the sellers that remain often have some driving motiviation for their sale, and many are pricing their homes to sell quickly. This has lead to an decrease in the overall days-on-market. This is how long it takes to sell a home, from the time a property is listed for sale until it goes under contract. Under contract means the seller has reached a binding agreement with a buyer . The sale has not closed yet, but the property if off the market. This is only measured on homes that have actually sold, so pending sales that fall out of contract aren't included. 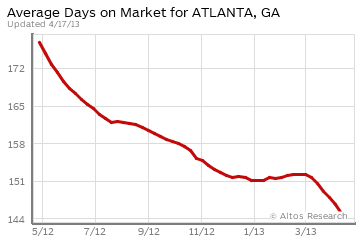 In other words, this is the actual time-on-market for homes that sold in Atlanta over the past year. Real estate is just like any other market in our economy, prices are driven by supply and demand. Even if there were no increase of buyers entering the market, the drop in inventory alone changes the supply / demand curve dramatically. Market action index is a measure of real estate supply versus demand. This index shows if the market is trending hotter or colder. A value above 30 indicates a “hot” or “seller’s market, while below that mark indicates a is a “cold” or “buyer’s market.” This can be leading indicator for prices. 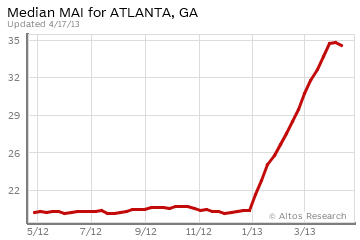 As you can see on the graph to the left, Atlanta has catapulted into seller's market territory this year. When one compares the trajectory of the MAI chart to that of the Inventory chart, it's readily apparent that there's more going on here than a simple decline in inventory. One can also see that, although the inventory declined throughout 2012, the MAI doesn't really jump up until 2013. There must also be a coincident increase in the number of buyers in the 2013 market to form such a hockey-stick graph profile. So, I would expect the number of fast sales in 2013 to surpass even the elevated numbers of 2012. This is a perfect storm for increasing prices, should it continue. What does it all mean for buyers and sellers in the Atlanta rea estate market? For sellers it means the tide is turning in your favor. You should be able to sell faster than in years past, and if trends continue, for a higher price. However, I must caution against "irrational exuberance", too. We are only beginning to turn this ship around, and sellers must be careful not to overreach on price. The homes that are selling fast are those that are in good locations, good condition, and most importantly, are priced correctly. While it's exciting to see that last year 269 homes sold in 3 days or less, it's also important to remember that nearly twice that many (535 homes) took over 180 days to sell. For buyers, it means that you can't hesitate on making offers, and you can't lowball anymore. Recently I saw a "coming soon" sign go up in the yard of an Atlanta home. I immediately notified my buyer, but before they could arrange their schedules to see the home, it was under contract with multiple offers. The home never even officially went "on the market" and it was gone. Yep, things have definitely changed here in Atlanta.